Our first major adventure for the year began with an early morning arrival at Dubai International Airport. In an ideal world we'd have taken a daytime flight from our home in Ireland, but doing so around our pre-existing commitments would have cut several coasters from our trip and both of us decided that we'd rather deal with fatigue. There was an hour-long queue for passport control when we landed, but in due course we'd made it through the various formalities and picked up our rental car, a white-coloured Toyota Corolla. We'd planned to begin our day at the park furthest away from the airport, but the delays at the airport made it more sensible to reshuffle. Our first stop thus became the Sahara Centre, home to Adventureland Sharjah. The park had just opened for the day when we arrived, but two of the three coasters were down due to technical problems. We decided to grab a quick breakfast before heading somewhere else, reasoning that we'd be driving past the place again later in the day. 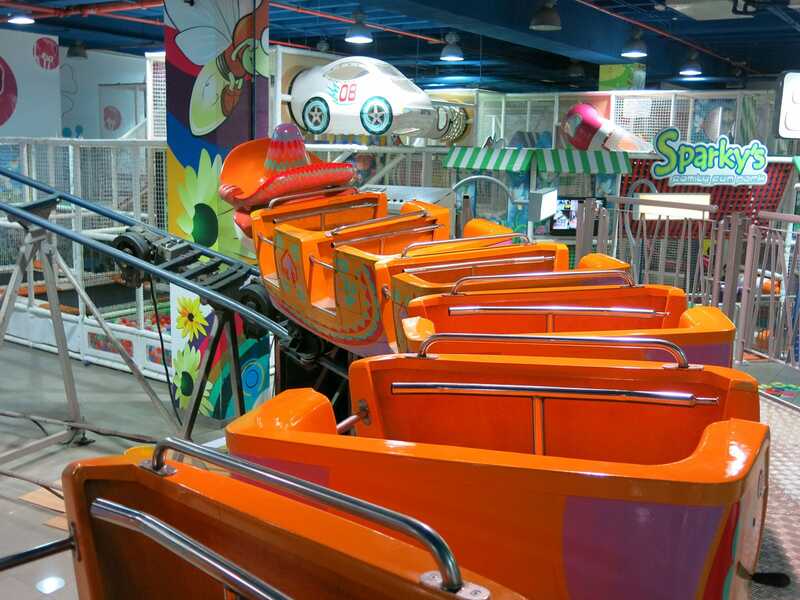 Antic's Land is a small Family Entertainment Centre in the Sharjah Mega Mall that is geared primarily at young children. On my last visit six years ago we took the time to do a haunted walkthrough, but on this occasion we decided to limit ourselves to Thunder Mountain, a family coaster with a single descending helix embedded into some artificial rockwork. When we first climbed into the train the dispatch button had no effect at all. The operator disappeared into a back room for a moment before returning for a second attempt, and sure enough the wheels on the lift began to spin, only to stop a few seconds later. Another member of staff was summoned and fiddled with something behind the scenes that allowed the train to begin clunking its way up the curved lift hill. The descent was surprisingly forceful given the scale of the ride, and it was actually quite uncomfortable until I figured out the trick, which was to sit with your back against the left hand side of the car. In that position the unbanked final right turn didn't hurt, allowing the strong laterals to be enjoyed in full. It took us three quarters of an hour to drive to the RAK Mall located just outside Ras Al-Khaimah in the north-eastern corner of the United Arab Emirates. Our target was the local branch of Sparky's and the imaginatively named Coaster (#2194), a pleasant if small credit from L&T Systems with the stereotypical Mexican mouse train and a somewhat loose figurehead that rattled back and forth as the train moved. It seems likely that this ride began its career somewhere else, given that it didn't open until three years after the demise of L&T, though where that might have been is anyone's guess. We were given a total of five laps, and had begun taking our usual photographs when a manager turned up. I wasn't privy to the conversation that took place but the stern expression and gesticulations made it fairly clear that pictures were not allowed. We decided it was best to make an exit before anyone asked us to delete what we'd taken. 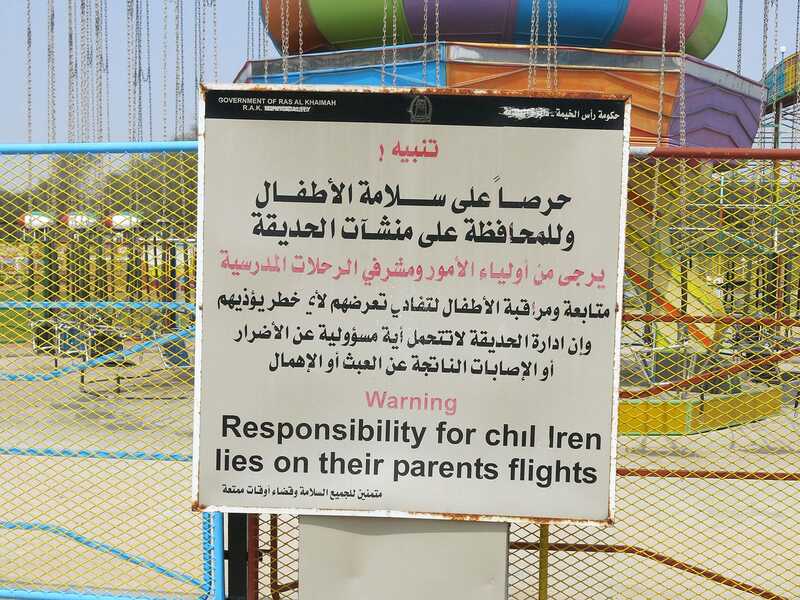 We had a bit of slack time in our day, and decided that it would be worth using some of it to make a brief stop at Saqr Public Park so that Megan could ride the powered coaster. It was a huge surprise to discover a completely remodelled facility including almost twenty new rides, including a credit. Nothing was open, but a member of staff told us to come back at about 2:30. We thus drove a few minutes up the road to the Safeer Mall. Fun City had yet to open for the day, but there were signs of activity, and given that we wandered into the adjacent food court for a meal while we waited. On my last visit two years ago there were plenty of food choices, but most of them had closed in the intervening time, leaving just Chowking (is it bad that I keep reading that as choking?) and KFC. The staff at the latter seemed surprised at the presence of customers, but were able to serve us, and half way through our meal the power for the various attractions came on. There was an electrical short of some kind on the air hockey table close to where we were sitting, as it reset itself several times with a disconcerting crackling noise, though it did eventually settle down. With tickets in hand we joined the queue for Roller Coaster, a figure eight coaster whose theming might well have cost more to construct than the ride itself. The superstructure contained two five foot tall volcanoes, an apple tree, and an impressive quantity of artificial plant life that obscured the support structure from view. The tracking was smooth enough, making for an enjoyable ride. We arrived back at Saqr Public Park at 3:00pm, and found ourselves a parking space about fifty feet from the new coaster. The various attractions were still closed, but there were a lot more guests around suggesting that things were indeed about to get going. Sure enough a large number of ride operators materialised a few minutes later and began to fan out in all directions. On my first visit to the park six years ago the powered coaster had the descriptive if slightly uninspired name of Speedy Train. At some point in the intervening time the ride was rebranded as Dragon Coster, despite the presence of reindeer antlers on the lead car. As we approached it became apparent that part of the motor mechanism was resting on the station platform, a sure sign that this was a non-credit we would not be enjoying today. We had more success with Worm Train (#2195), a Big Apple whose sole restraint was a bar across the top of the car whose effectiveness could be summarised by the fact that Megan managed to climb into the car without releasing it! Al Montazah Park is built on an island in the middle of Khalid Lagoon just to the north of Dubai. The site was home to Al Jazeera Park from 1979-2012, but that park was razed shortly after its closure taking quite a few attractions with it, including a giant wheel and a custom layout log flume set above an artificial lake. Readers should be aware that the approach to the park from the north requires navigating a ridiculously complicated junction that is made worse by the local disregard for traffic regulations. Those not accustomed to driving aggressively would be best advised to approach from the south. The new park is beautifully themed, and the presentation is far better than is usual for the Middle East. The rides are geared almost exclusively at young children, though we did see a Technical Park Street Fighter whose colour scheme suggested that it might have been the machine that once toured in Ireland. There wasn't much room in Worm Train (#2196) but we were able to shoehorn ourselves on board in separate cars. The restraints were simple seat belts that closed with a little effort. It was early evening and jet lag had begun to take its toll when we arrived back at Adventureland Sharjah and the place was actively crowded. That said, however, there seemed to be far more spectators than riders, and indeed the queues for all the attractions were short. Two years ago the park installed Rocket Cycles (#2197), a custom-designed motorbike coaster from Zamperla. The layout begins with a L-shaped tyre drive lift leading to a superbly intense descending helix that goes almost all the way to ground level, marred only by a rather awkward transition at its base. The rest of the course remains close to ground level, turning from side to side a few times before reaching a brake run parallel to the loading platform. The ride is short, but highly enjoyable nevertheless, and all passengers are given two laps. Both powered coasters had been renamed since my last visit six years ago, with Adventure Train becoming Forest Train and Quantum Leap becoming Kukulcan. The ride stations located side by side had the somewhat more prosaic names of Slow Train and Fast Train, and these names were spot on. The former moved at walking pace on a broadly oval shaped track that did nothing of consequence, while the latter went all over the place at considerable speed, delivering strong laterals and even one brief pop of airtime.